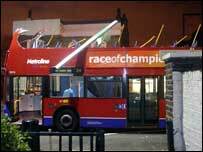 The roof of a double-decker bus was ripped off when it hit a bridge in north-west London. Transport for London said the number 24 was out of service when the accident happened in Prince of Wales Road, Kentish Town, early on Sunday. Residents reported hearing a loud noise as the vehicle hit the bridge at Kentish Town West station. The driver was treated in hospital for shock and the bus, which is operated by Metroline, was later towed away. Daniel Taylor, 27, who lives close to the bridge said the first he knew of the accident was the sound of "screeching metal". "I looked out of the window and the roof had been completely ripped off and the bus driver was still sat in his seat. "The police were on the scene fairly quickly and cordoned the area off." The bus was towed away a few hours later and the wreckage cleared from the road.